This is seventeenth in the series on the rich cultural heritage of ancient temples in India. There are various intricate sculptures in each of these temples where each one of them is better than the other. Chennakesava Temple at Belur is renowned for its sculptural marvel. 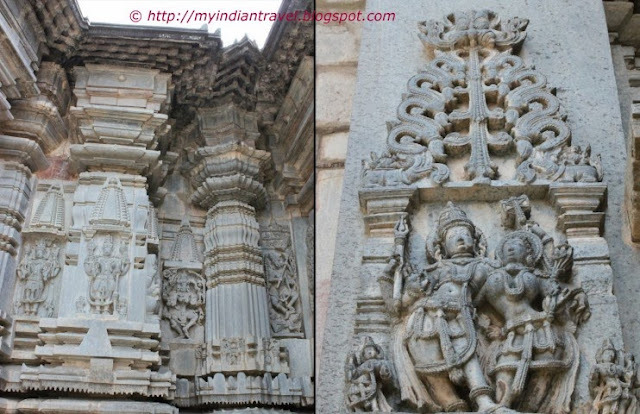 Here are some of the sculptures that are present on the exterior of the temple on the south-west wall. Harihara (Lord Vishnu) standing with a bull on the right and Garuda on the left. Lord Shiva overcoming the demon Jalandhara whom he lifts up with the point of his trident. Saint Parasurama with battle axe. We will explore more of this sculptural heritage soon. beautiful photography. What about Halebidu? Superb.. I was fortunate too to have visited this marvelous place..
You are correct, Rajesh -- each temple is more interesting and fascinating than the next! your temple posts always amaze me!! Beautiful stones. I am dying to go to India. Thanks for sharing your photos and experiences! These are beautiful, intricate sculptures. They are treasures indeed. Magnificent carvings. Nice shots of it. The beautiful temples in your country never fail to amaze me, Rajesh!! Terrific captures as always! Thank you for sharing!! Hope you have a great week! a lot of work and superb craftsmanship in every temple. A perfect title for this beautiful post. The sculptures are certainly poems .. Or even prayers ..the persons who did this work must have had guidance from the Gods. Amazing carvings and details. Thanks for sharing, Rajesh! Beautiful carvings in the stone. Wow - what precious and lovely sculptures. Such beauty in the intricate detail of such architecture...beautiful! Lowell: It is part of his dress around his waist. I wish I had a second life and time to see all those beautiful pieces of poetry in stone! Thanks,Rajesh, for sharing this. I always look forward to your posts and seeing and learning about the temples. Amazing intricate architecture and photographs. I like the little saint with his axe in the last picture. So this is #17 or the historic temples. Hope there are lots more. These sculptures are amazing. Very beautiful, - the architecture and the photography. It really is poetry in stone. Amazing how much time, money and effort was invested in our temples. It all seems worthwhile though considering they are still Irving us so much pleasure. beautiful sculptors, are rhe rocks used granite? Amazing photography..... You are very lucky to visit these temples!! Nice title with great pictures..